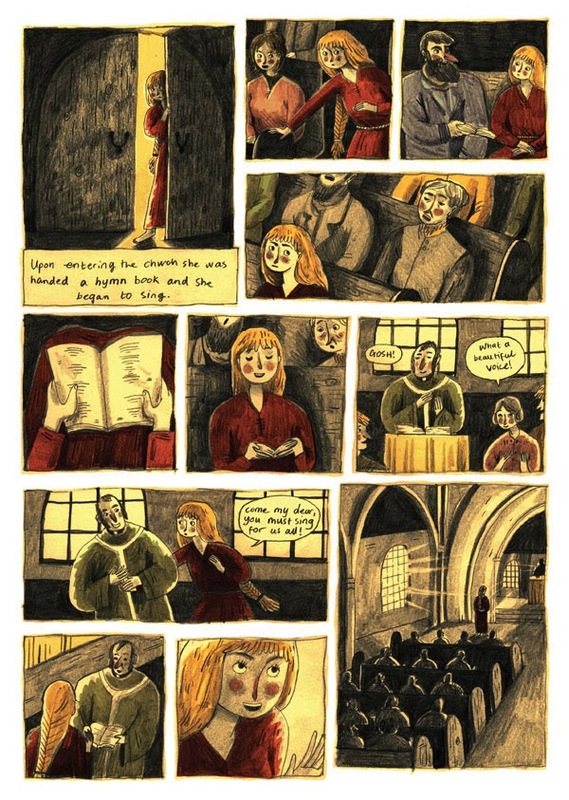 Briony May Smith is one of a new crop of British artists that have arrived on the scene in the last few years, a group which have me excited about the future of comics on our little island(s), and one of a few emerging comics artists currently studying at Falmouth University (home also to Lucie Ebrey et al -must be something in the sea air). Having undertaken a foundation in creative arts, she is now in the midst of completing the final year of her illustration degree, taking on free-lance work simultaneously. Her work caught my eye, because it's a style that seems very familiar in tone and immensely accomplished, yet individual in personality; the more you look at it, the more nuances you notice incorporated. 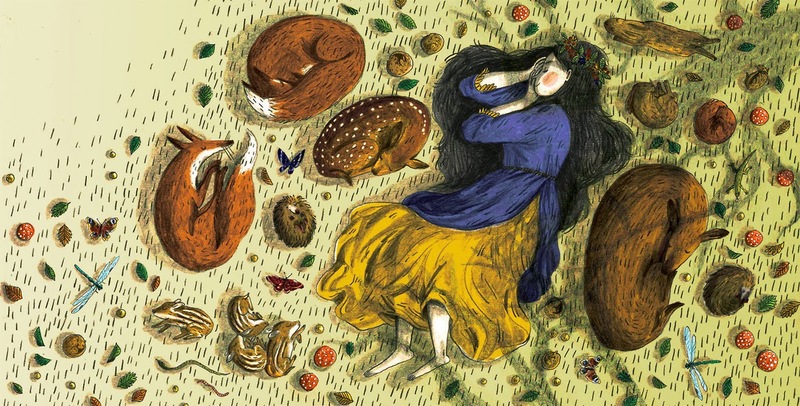 One aspect in particular I love about her illustration is that while it exudes romance and beauty, it merges that quality with a sort of rough, textured feel, both facets which combine well to reflect her subject matters of choice: nature, folk-lore, myth, the outdoors, the spiritual and supernatural. It's the type of work that you can see slotting into Jonathan Cape's stable with ease, and at 21, it's amazing to think Smith will only get better and better. I know it's always difficult to articulate why you do what you do, but what is it about the visually illustrative that resonates with you? Something that you think the medium allows you to do that isn't as possible with others? I have always really loved drawing so if I were doing something else I’d still be doodling away. It’s just a great way to express what you imagine. I can also watch TV at the same time! I love stories. I love reading and watching films and making up my own stories, and whilst I enjoy writing, nothing expresses the joy of creating a story for me better than seeing the characters on the page. Potential audience aside, what are the similarities and differences between creating comics and children's books? What do you like about each? Is there any particular one that you're interested in pursuing? Children’s book and comics are very similar to me. They are both ways of expressing a narrative. I would love to be able to pursue both, but the part I love most about story telling is the characters. The reason I get hooked on books and films and TV is to watch the characters that you fall in love with. It’s my favourite part about creating stories, learning all about the protagonist before you create a little world for them to live in. Children's books are so enjoyable to write, to have characters stomp around the page and imagine them speaking in grumpy voices or squeaky sentences. I love illustrating them because there is a beautiful look to having the illustrations alongside the text, brought to life as they get read. 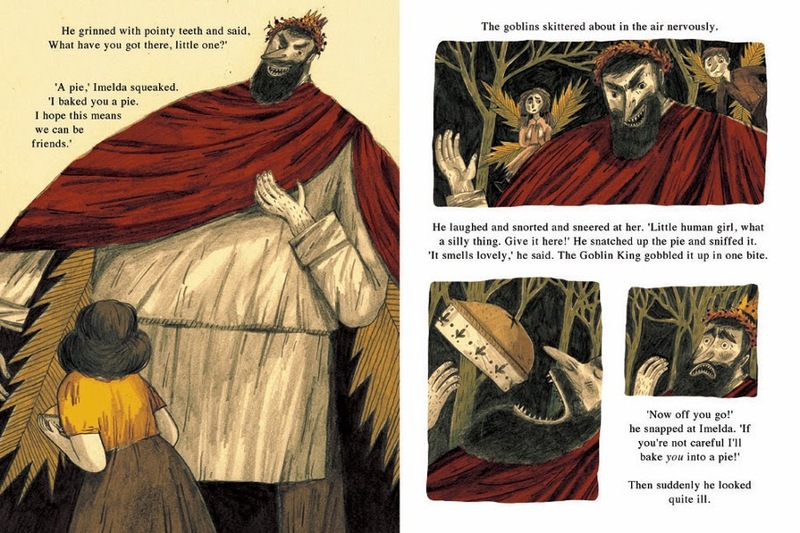 In children's books text and image go hand in hand. With comics I can use grown up themes a little more, and the stories can be darker and more complicated. I also love using panelling because it’s hard to say all you want in one image, and you can tell the story without a bulk of text explaining it all. Comics are great when the children’s book idea I have is too long or too grown up. Do you read a lot of comics? Is there a particular kind you enjoy? Any favourite authors? 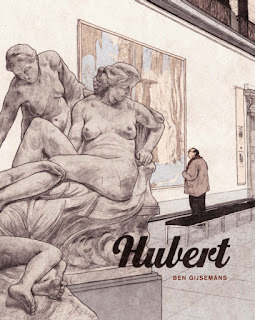 I read lots of different things and it’s just one part of the kind of illustrations/stories I like. Not really a comic, but Charles Vess and Neil Gaiman’s 'Stardust’ is a favourite of mine. 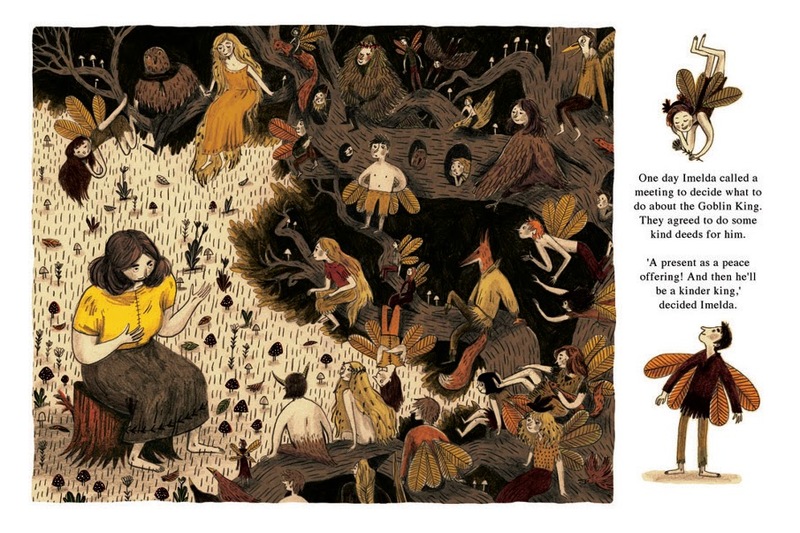 Also David Wenzel’s version of ‘The Hobbit,’ Isabel Greenberg’s ‘Encyclopaedia of Early Earth.’ I really love Emily Carroll and Kate Beaton’s short comics, and the work of Noelle Stevenson, Joe Todd Stanton, Luke Pearson, Warwick Johnson Cadwell and Mikkel Sommer. It’s the art that I love the most in comics. A lot of artists are on the Internet in various guises now, as are you, how do you think it's helping/working for you- do you have a plan, or is it just about putting work out there for people to see? I just want to get my work out there, and the internet is perfect for that. 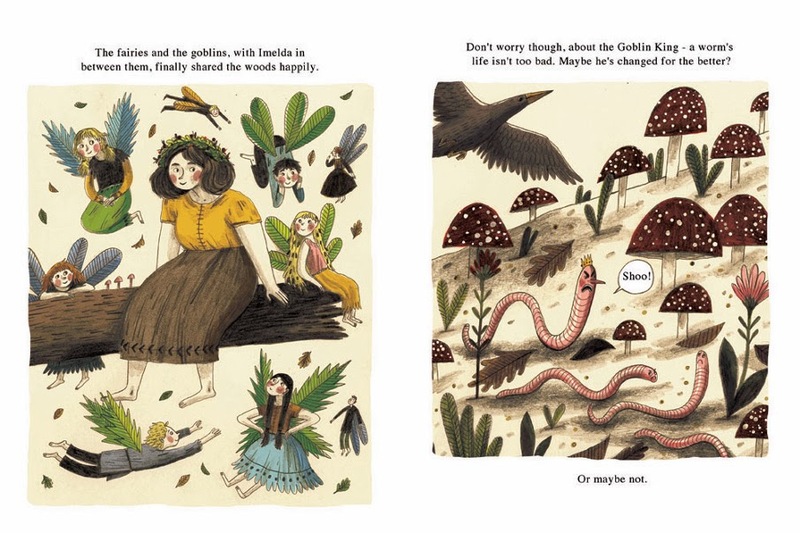 I don’t have a ‘guise’ because I think that’s helpful for artists who have a range of styles, where as mine are quite similar looking - in children’s orientated books and comics. You have a beautiful folk-ish style that transmutes really well with the type of mythic, folky tales you tell: mermaids, goblins etc. What is about that type of subject matter that appeals to you? I'm glad my style comes across folk-ish! I love mythology and folklore, there is a certain rhythm to those kinds of stories. All over the world the folklore from different countries has it's different recurring themes and creatures, and I love reading about all of them. I really like English folklore and Celtic mythology, half my family are from Ireland, the other half are English. 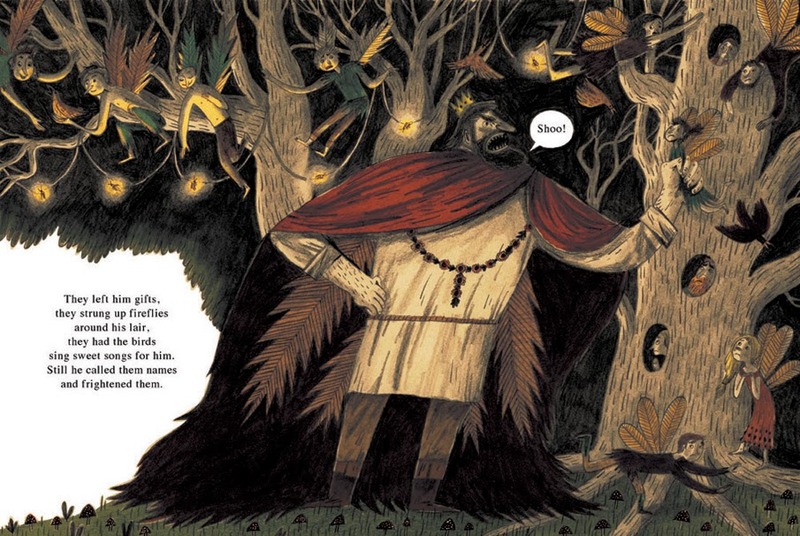 I also enjoy Russian folktales and Greek mythology, and Swedish fairytales. I love the artists that are known for illustrating them, like Arthur Rackham and John Bauer. Sometimes folktales are hilariously strange, in the Welsh myths of the Mabinogi, Lleu can only be killed with a spear that takes a year to make when he has one foot on a goat and the other on a tub. Which his wife convinces him to do. It's also from a childhood love of fairy stories and Disney films. I still love making up stories like my brother and sister and I would make up games, with fairytale creatures, but they are a bit more informed about the patterns and recurring themes folktales have. I think I will always love goblins, mermaids and fairies! About exploring more grown up themes for adults, a lot of fairytales/ myths often have very dark connotations- is that something you're interested in exploring within the folkic genre you're drawing from? Although there is a lot of symbolism in mythology, I haven't deliberately used it so for hinting at darker themes! I do find it interesting how forests, figures and the landscapes represent so much more than the story implies. 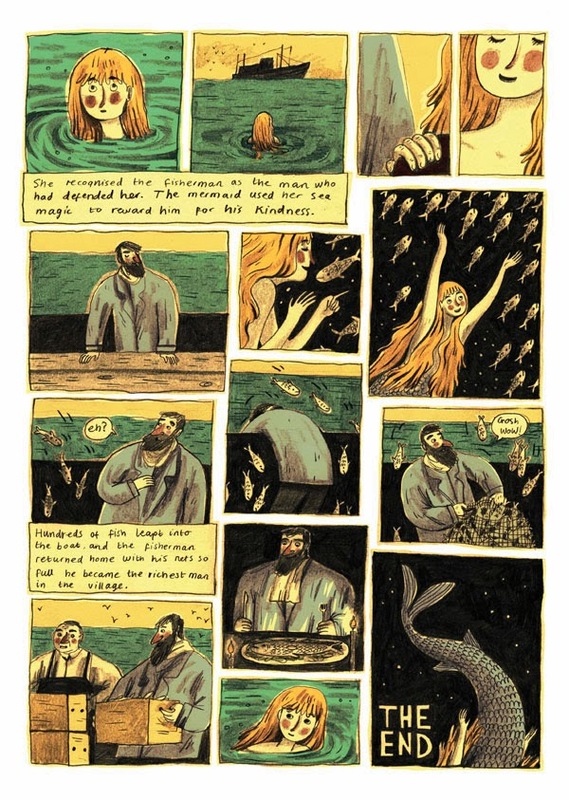 I am aware of more general symbolism, in my comic ’The Farmer’s Wife' I made the wife turn into a ‘tree,’ and the mermaid in the 'Mermaid of Zennor’ is about the supernatural vs. humans. 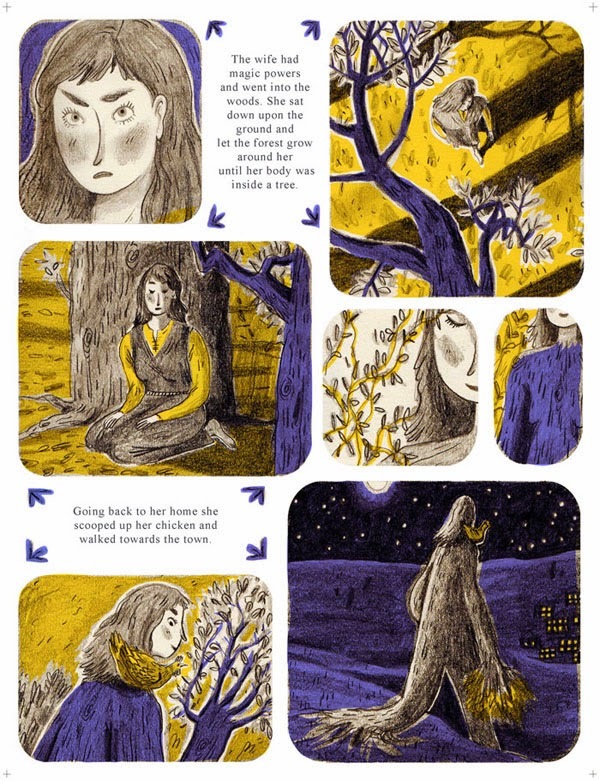 I think there is a strong connection between women and nature which is championed in folktales. The supernatural creatures are normally women - selkies, mermaids, nymphs, fairies, huldras, the idea of ‘mother nature.’ The female connection to the landscape and the conflict with the human world is one of the most common themes of folklore. What have you got upcoming by way of projects? I would love to write more children's books and comics, and maybe some that are actually based on real ballads and myths. 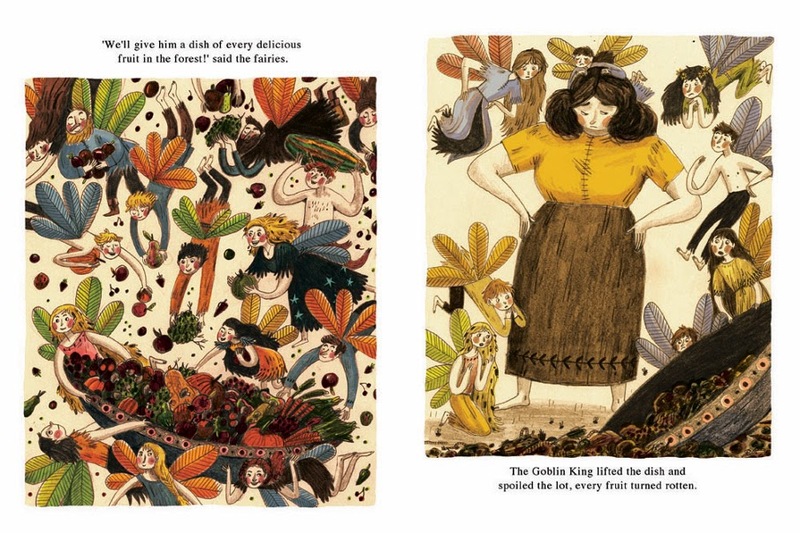 In March I will be going to the Bologna Children's Book Art Fair, and I also have a course trip to New York in May which will all be very exciting! So all my next projects will be in preparation for those trips, getting together a diverse portfolio. Many thanks to Briony for her time.